We’d love your help. Let us know what’s wrong with this preview of Heaven by Randy Alcorn. What is Heaven really going to be like? What will we look like? What will we do? Won't Heaven get boring after a while? We all have questions about what Heaven will be like, and after 25 years of extensive research, Dr. Randy Alcorn has the answers. In the most comprehensive and definitive book on Heaven to date, Randy invites you to picture Heaven the way Scripture describe What is Heaven really going to be like? What will we look like? What will we do? Won't Heaven get boring after a while? In the most comprehensive and definitive book on Heaven to date, Randy invites you to picture Heaven the way Scripture describes it-- a bright, vibrant, and physical New Earth, free from sin, suffering, and death, and brimming with Christ's presence, wondrous natural beauty, and the richness of human culture as God intended it. This book was given to me as a birthday gift. I had not heard of author, Randy Alcorn prior to reading this book. Anyone have an opinion regarding his ideas about Heaven, Hell, God, Jesus Christ, the New Earth? I love this book! Even more now that my husband has been diagnosed with a dreaded cancer, incurable but treatable. I've had this book for a few years but always skimmed a chapter or two until now. Randy Alcorn writes so wonderfully about Heaven and what it will be like for the believer. A true inspiration for those of us who belong to Christ. For many Christians this book represents an "outside-of-the-box" approach to thinking about and envisioning Heaven. The common theme is "What if?" and "Why not?" when it comes to the realities of our future Home. The author lays the groundwork for his claims with specific scriptures on the topic that have been undertaught and/or passed off as figurative. This is a refreshing look at Heaven that has given me a renewed anticipation of my ultimate reward! Have to say this book was largely a 476-page exercise in begging-the-question. Alcorn begins by assuming that the New Jerusalem of Revelation and the New Heavens/New Earth of Isaiah describe the final state of heaven and then deduces virtually everything about heaven from those axioms. If he’s wrong about those passages, then the book could only be about twenty pages long. The problem is that Isaiah’s description of the New Earth still includes death: “No more shall an infant from there live but Have to say this book was largely a 476-page exercise in begging-the-question. Alcorn begins by assuming that the New Jerusalem of Revelation and the New Heavens/New Earth of Isaiah describe the final state of heaven and then deduces virtually everything about heaven from those axioms. If he’s wrong about those passages, then the book could only be about twenty pages long. The problem is that Isaiah’s description of the New Earth still includes death: “No more shall an infant from there live but a few days, Nor an old man who has not fulfilled his days; For the child shall die one hundred years old, But the sinner being one hundred years old shall be accursed” (Is. 65:20). Though Alcorn cites the latter chapters of Isaiah to prove the final state of heaven over fifty times, he avoids this verse, except for one parenthetical dismissal of it (323). But if there’s death in “heaven” then it’s not the final state; it’s something else. In the same way, if Isaiah wasn’t speaking of the final state, then, we shouldn’t assume that John was speaking of heaven when he invoked Isaiah’s language at the end of Revelation. Alcorn repeatedly insists on literalism to make his case, but he doesn’t live up to it. John describes the New Jerusalem as a city and a bride. John sees “the bride, the Lamb’s wife” (Rev. 21:9). But Alcorn has to ignore that literalism to only embrace the literalism of a city. In addition, notice death and sin lurk outside the New Jerusalem: “they shall bring the glory and the honor of the nations into it. But there shall by no means enter it anything that defiles, or causes an abomination or a lie” (Rev. 21:26,27). If this were the final state of heaven, how could there be any fear that sin and abominations could enter it? I certainly don’t object to Alcorn’s take on heaven because of any “Christoplatonism” – i.e., the view that denigrates the resurrection and makes heaven purely spiritual, with no eating, drinking, dwelling, working, playing, etc. I believe we will do all those things in heaven in true bodies, and, like Alcorn, I believe the final state of heaven will be on a restored earth. So what’s the beef? The beef is that forcing all these texts which are really about the church on earth into the final state alone distorts the whole calling of the gospel, distorts the calling of the church. The church is supposed to be heaven on earth. We’re not supposed to wait for Christ to fix it all in the final state. He gave that job to us: that’s the Sermon on the Mount. We are the ones who pray “Thy kingdom come, Thy will be done, on earth as it is in heaven.” Jesus brought the “kingdom of heaven” to earth. That’s the whole point of His mission. The cross and resurrection initiated the new world promised in Isaiah. The Holy Spirit came at Pentecost and started New Heavens and New Earth then. Jesus said the church was that “city on a hill” to the world. And when Christ and the Spirit have created that kind of just church community pictured in Isaiah, then we will face the final judgment, when that church that has followed the OT and Jesus’ path in caring for the weak and marginal will enter into greater glory (Matthew 25:31ff), the final state. But notice if you sequester all the church’s glorious duties off into the future state alone, then the church here and now becomes an irrelevant, intellectual club, like most conservative evangelical churches today. We firmly believe our job is only to get individual bodies into heaven, and we read most of the NT, especially Romans, as instructions about how to get into heaven, when in fact the NT message is much richer and more challenging than that (to get a fun shock try reading Romans as if it isn’t about heaven but more like Habakkuk and Isaiah). If we’re just an intellectual club then we’re reduced to cheap grace. And Alcorn gives us that cheap grace that prevails in conservative evangelical churches. How does Alcorn assure us that we’ll make it into heaven? His answer is purely intellectual: “Make the conscious decision to accept Christ’s sacrificial death on your behalf” (36) Isn’t it at all strange that Jesus doesn’t talk this way? And, as expected, Alcorn has to warn us against works: “Those who assume their religious activities alone will get them into Heaven will have a terrible surprise ahead” (36) – as if the promoters of cheap grace won’t be even more shocked. It was okay, but it should have been much better. The subject deserves better, and Alcorn is capable of better. For openers, he crowded two or three hundred pages of essentials into almost six hundred. He hid his serious arguments in idle speculation and self-quotations (yes, he cites his own fictional works). Believers in the literal inerrancy of the Bible may even have trouble which some of his convoluted logic, but most of it is so buttressed with footnotes (see above) and Biblical citations It was okay, but it should have been much better. The subject deserves better, and Alcorn is capable of better. His thesis, that Heaven is real, may seem an oxymoron to Christians, but he'd quickly add, "No, really real. And there are two of them . . . no, three. From a certain point of view." Acorn's tome is almost saved by the wonderful sidebars which litter the text, but what it really needs was a good editing. I didn't finish this book....got about 3/4 of the way through it and it became so repetitive and so much conjecture that I just didn't see the point. I will say that the first several hundred pages are devoted to the actual theology of Heaven and Alcorn does a great job of documenting his claims Biblically, and I enjoyed this part very much. I also want to give him credit for not being dogmatic about his eschatological view, and for (repeatedly) stating that his vision of what the New Creation w I didn't finish this book....got about 3/4 of the way through it and it became so repetitive and so much conjecture that I just didn't see the point. I will say that the first several hundred pages are devoted to the actual theology of Heaven and Alcorn does a great job of documenting his claims Biblically, and I enjoyed this part very much. I also want to give him credit for not being dogmatic about his eschatological view, and for (repeatedly) stating that his vision of what the New Creation will actually be like is "his" idea and not necessarily scriptural. The man has a great imagination. The good thing is, IMHO, that the reality will be even greater than what he has imagined! One of the Sunday morning Bible classes at our church did a study based on this book. I didn't agree with everything in it, but I enjoyed it overall. One of the main takeaways was the idea of continuity from this life to the next: we won't be disembodied spirits, creation is still good and meant to be cultivated, etc. Some other thoughts here. "As long as God keeps you here on Earth, it’s exactly where he wants you. He’s preparing you for another world. He knows precisely what he’s doing. Through your suffering, difficulty, and depression, he’s expanding your capacity for eternal joy. Our lives on Earth are a training camp to ready us for Heaven." This book completely changed my view of heaven. It made me realize some things that I had believed but never really realized what I believed. This is packed full of scripture references - so it isn't just his opinion. This has helped me look forward to heaven as well as see how my life here on earth right now ties in with my life that I will live in heaven....I realized that I used to think that you lived here, then you died and then everyone started out on the same playing field again (so to spe This book completely changed my view of heaven. It made me realize some things that I had believed but never really realized what I believed. This is packed full of scripture references - so it isn't just his opinion. I've cried buckets of tears while reading this book. It gives me such a longing for what God has prepared for those who love Him. Sometimes I wonder what I will do when I meet Jesus for the first time. Will I dance for joy, fall down and worship Him, or give Him a huge hug? I do know I will be delighted and thrilled! I can't wait to see the home that He has prepared for me. I can imagine that one of the first things I will be doing will be dancing with the pure joy of living. One idea that thrill I've cried buckets of tears while reading this book. It gives me such a longing for what God has prepared for those who love Him. Sometimes I wonder what I will do when I meet Jesus for the first time. Will I dance for joy, fall down and worship Him, or give Him a huge hug? I do know I will be delighted and thrilled! I can't wait to see the home that He has prepared for me. I can imagine that one of the first things I will be doing will be dancing with the pure joy of living. One idea that thrills me is all the animals that I hope to be there. We will all be able to live in peace and harmony the way God originally intended. I am excited by the fact that there will be no pain or sorrow, death and sad farewells. We can be with our friends for all of eternity without sin to mar our relationships. We will be able to become acquainted with those who have gone before us and people from other lands. We will know and understand their stories. I can't wait to attend the universities there where I will be able to learn the complete truth without fear of deception. I believe that many of my dreams will be fulfilled. No doubt I will be able to travel around the world. Who knows? Maybe I will even travel to outer space! Great biblical insight about what heaven and the new earth will be like - and how incredible (and not boring) both will be. Reminds the reader that God is accomplishing everything for His name's sake - for His own glory it shall all be accomplished. And the already accomplished work of Christ - his life, death, and resurrection - are not only the means by which individuals are saved from their sins against God, but also the means by which the whole earth (all of creation) shall be redeemed. This b Great biblical insight about what heaven and the new earth will be like - and how incredible (and not boring) both will be. This book has a jazzing affect on Christian readers - not only concerning the new earth - but also in their desire to share the good news of Jesus with those that do not yet believe. They are reminded that God is sovereignly at work using them as clay vessels to share with others His plan of redemption for this world. O melhor livro sobre céu. Este livro de Randy Alcorn é o melhor disponível sobre o céu. Em alguns momentos ele parece vacilar, sugerindo uma interpretação muito literal de Apocalipse. Mas a tese central do livro é excelente. Esta Terra será transformada e restaurada. Aqui os eleitos habitarão eternamente com o seu Deus, desfrutando de café, vinho e comunhão. Over all, much better than I expected. I am pretty excited about reading this book, because at times I can be rather apathetic about heaven. I know my vision can Fall flat on it's face in light of what is coming. In the preface he talks about Florence Chadwick swimming from Catalina Island to the shore of mainland CA-- she stopped 1/2 a mile from the shore. The next day she said, All I could see was the fog....I think if I could have seen the shore I would have made it." Alcorn's vision is to show us the shore. This book, has chang I am pretty excited about reading this book, because at times I can be rather apathetic about heaven. I know my vision can Fall flat on it's face in light of what is coming. In the preface he talks about Florence Chadwick swimming from Catalina Island to the shore of mainland CA-- she stopped 1/2 a mile from the shore. The next day she said, All I could see was the fog....I think if I could have seen the shore I would have made it." Alcorn's vision is to show us the shore. This book, has changed my perspective on heaven and renewed my desire to live in preparation for heaven. Alcorn challenged some of my false assumptions. The biggest for me (although it wasn't overly significant in the book) being that wild is good and God-created, and architecture and cities are bad. I picture the idyllic country side and forests, mountains and streams, but cities are depicted in heaven, and architecture is a God given art form. The book was rather long winded, because he thoroughly explains each view point. I would like to own it, to revisit some of the sections I skimmed. I also have a feeling he probably doesn't have it ALL right-- and he says that himself-- but he certainly aids in a healthy and righteous anticipation of "home". Alcorn used The Chronicles of Narnia for many examples. I love the Last Battle, and Lewis' depiction of heaven. That led to much good conversation with Eli about the future. My other favorite fictional account of heaven is in "Peace Like a River" one of my favorite all-time books. I think Alcorn has a number of resources on Heaven, and I am particularly interested in the kid's version. A hardback borrowed from my Mum. Fascinating! Here is the best reason to read it, quoting from the book: "Satan need not convince us that Heaven doesn't exist. He need only convince us that Heaven is a place of boring, unearthly existence. If we believe that lie, we'll be robbed of our joy and anticipation, we'll set our minds on this life and not the next, and we won't be motivated to share our faith. Why should we share the 'good news' that people can spend eternity in a boring, ghostly place A hardback borrowed from my Mum. Fascinating! Here is the best reason to read it, quoting from the book: "Satan need not convince us that Heaven doesn't exist. He need only convince us that Heaven is a place of boring, unearthly existence. If we believe that lie, we'll be robbed of our joy and anticipation, we'll set our minds on this life and not the next, and we won't be motivated to share our faith. Why should we share the 'good news' that people can spend eternity in a boring, ghostly place that even WE'RE not looking forward to?" Unfortunately, as a church we have done a poor job casting a captivating view of Heaven to our children. This bled into adulthood for me. When I began reading this book, my perception of Heaven was painfully boring. The problem was, I had never been shown just how much the Scriptures have to say about the place. Instead of viewing the Earth we live on as a shadow of what is to come, I pictured heaven as being other-wordly and ethereal. Randy Alcorn's mat A life-altering, paradigm-shattering book. Although repetitive in places, the author presented ideas, supported by scripture, that caused me to to step back and reevaluate what I had previously thought about heaven. This book appears to be very well researched and in my view, the author depicts a credible and compelling view of heaven. I highly recommend this book, including the appendices, for anyone that is curious or not sure what to believe about heaven. I learned that I have a very limited view of what Heaven can be like. I think that I have grown spiritually because of this book and have become excited learning about Heaven. Yes, I will see my pets there and lions and horses and all other kinds of animals. Lions and tigers and bears, oh my. You mean we won’t be spending eternity as disembodied spirits floating around on clouds playing harps. I was so looking forward to that! According to the author if we can imagine it then it is a possibility. Not the disembodied spirit part. The author does a very good job bringing out the biblical evidence that this is not true. However, he speculates that we will possibly be able to travel the new universe to visit other planets. So if this is a possibility than why not be able to float on a cl You mean we won’t be spending eternity as disembodied spirits floating around on clouds playing harps. I was so looking forward to that! According to the author if we can imagine it then it is a possibility. Not the disembodied spirit part. The author does a very good job bringing out the biblical evidence that this is not true. However, he speculates that we will possibly be able to travel the new universe to visit other planets. So if this is a possibility than why not be able to float on a cloud playing a harp. Anything is possible with God. The question is will he allow us to do these things? Who knows! The author did an extremely thorough job uncovering the biblical truth about heaven. He definitely heightened my understanding of some specific truths. As well as opening my eyes to some I was unaware of. I did feel the book was somewhat repetitive though. He probably could have shortened it by a couple of hundred pages. It was because of this, in part, that I was not excited to sit down and read this book everyday. I would caution any new believer reading this book. The author quotes C.S. Lewis quite often. C.S. Lewis is a man who happens to be a Christian who writes stories. His books often paint a wonderful illustration of what we might experience on the new earth. They may also offer some biblical truth. However, his writings are not the inspired word of God. So be careful not to confuse the two. There is one more thing I would like to impress on everyone. I say this with caution because it is not my intent to accuse the author of bad hermeneutical practices or improper exegeses. Some of the passages the author references are not necessarily heaven passages. They may contain some information about heaven. But their original meaning may be something entirely different. The author sometimes reads between the lines of a passage to draw some conclusions about heaven. This is not a bad thing. I don’t think he crosses any lines in this matter. However, if you are a new believer don’t let this confuse you. I guess my point is. Do not neglect to read your bible. Investigate for yourself what the author is trying to communicate. This book was a breath of fresh air for a believer who feels presently stuck in an evil world and lacks the desire for an ethereal "otherness," convinced that he or she was created for something more. Alcorn presents the argument that our culture's view of Heaven, a cloud-lined, white-washed, harp-filled existence, leads believers to desire this world above the one we were created for. As Christians, we should be filled with hope and desire for Heaven, not dread or avoidance. Though some might argue that Alcorn is too far-fetched or speculative in his perspective on Heaven, I am not sure that it is a problem. Most all of his speculations are based on Biblical citations, and a great number of them are presented precisely as such -- speculations. He openly admits that some of his book will be dead wrong, though he offers that some of it will be close, if not correct. I think his point in writing speculative thoughts is more so to start inciting thought about Heaven and dreaming of the greatness to come than to simply submit to the culture's view of Heaven. Our culture says we'll be bored and lonely and senseless in Heaven, but Alcorn desires for readers to challenge our culture. He presents a Heaven based on Scripture and filled with ideas I had never dreamed of for Heaven -- adventure, exploration, entertainment, friendships, etc. My view of heaven wasn’t quite as dull as Larson’s, but it wasn’t much better. I recently taught a group of sixth grade boys about what they thought of heaven, and their picture of heaven mirrored mine: a worship service that never ended, standing around the throne of God and singing song after song after song after song. Perhaps the most important argument that Alcorn makes is how significant it is to understand the reality that our final destiny as followers of Christ will be in new (physical) bodies living in a new (physical) earth. “We should stop thinking of Heaven and Earth as opposites,” Alcorn insists, “and instead view them as overlapping circles that share certain commonalities.” When we sing the old gospel songs “This world is not my home, I’m just a-passing through,” and “Like a bird from these prison walls I’ll fly, I’ll fly away,” we speak half-truths at best. The truth is that ever mountain vista, every breathtaking sunset, every bubbling brook, every stunning piece of architectural beauty points us to a world that we were designed for and will one day inhabit. The pictures of the new earth we have in scripture (see Isaiah 25, John 14, Revelation 21-22) are a combination of breathtaking natural and human-designed beauty that blends Eden and architecture. Most orthodox Christians readily reject the liberal notion that the resurrection of Christ wasn’t bodily. As John Updike so powerfully put, “Make no mistake: if He rose at all it was as His body; if the cells’ dissolution did not reverse, the molecules reknit, the amino acids rekindle, the Church will fall.. Let us not mock God with metaphor, analogy, sidestepping transcendence; making of the event a parable… let us walk through the door.” And yet, as Alcorn reports, 2/3rds of Americans who believe in resurrection of the dead do not believe we will have bodies. We don’t understand the implications of the powerful truths we hold to. In heaven, we will be physical! Can we learn in heaven? According to one survey, only 18% of Americans believe that people “would grow intellectually in heaven.” It makes sense. We should know everything in heaven, right? In the presence of God, how would all knowledge not be ours? And yet, we will be learners in heaven. Ephesians 2:6-7 says, “God raised us up with Christ and seated us with him in the heavenly realms in Christ Jesus, in order that in the coming ages he might show the incomparable riches of his grace.” Do you catch the presumption of active learning in heaven in that verse? God is going to show us the incomparable riches of his grace… in the coming ages! We will certainly understand the wonder of God’s grace on the cross more perfectly, but we will also be shown more profoundly God’s grace in creation, in art, in science, in beauty! God’s first words to Adam and Eve echo his purpose for them, “Be fruitful and multiply and fill the earth and subdue it, and have dominion over [it].” We were made for dominion. We were made to rule, to steward, to create, to organize, to care. We were made to work. The curse for Adam’s sin in Genesis 3 is not that he will work; it’s that his work, for the first time, is going to be hard. He’s going to battle thorns and thistles, and his work is going to make him sweat. In heaven, we will experience work restored (and even better!) than the work Adam experienced: fulfilling, exciting, purposeful. We’ve all had a glimpse of this promise in our lives. Even in some of my early jobs I remember the satisfaction of purposeful work. I remember creating my own twist of a dish when I worked as a chef in a fast food Japanese restaurant in high school. I was delighted as the staff greedily gobbled down my new concoction. I remember the feeling of having deep cleaned, re-stocked, and re-organized the officer’s tower when I worked as a Detention Officer. And of course, there have been so many powerful moments of joy as a pastor. “Do you know, dear friends, the deliciousness of work?” Charles Spurgeon once asked his congregation. Do you? You will! We are Christ’s workmanship, “an instrument for noble purposes, made holy, useful to the Master and prepared to do any good work.” God will not turn his instruments prepared for noble purposes and good works into paper weights in heaven. Days will roll by, each as full and dynamic, and restful, and delightful as the last. There will be laughter and work and discovery and all of it will be done as worship. Can you wait for that dynamic day? Some of the most surprising and revealing passages in scripture are the glimpses we have of the resurrected Christ. In these snapshots, we have brief previews of what our bodily resurrection will look like. In two of these snapshots we see Jesus eating fish with his disciples. What? The resurrected Jesus is eating? He sure is. If, as I believe, animal death was a result of the Fall and the Curse, once the Curse has been lifted on the New Earth, animals will no longer die… This suggests people may become vegetarians on the New Earth, as they apparently were in Eden during the time before the Flood. Throughout his book, Alcorn chooses Eden over Pentecost as a picture of what the new heavens and new earth will be. Scripture points to both (Eden and Pentecost) in picturing the new heavens and the new earth, but when there is a tension between the two, I believe Pentecost points us more faithfully to what the reality will be. For example, the diverse throngs of people from “every nation, tribe, people and language.” Peter’s vision from God to “Kill and eat” all types of animals , then, is a continued unfolding of the in-breaking Kingdom. Jesus, after all, eats not just bread, but bread and fish in his resurrected body. Alcorn contends this was because it was because he was still on the unresurrected Earth under the Curse. But why would God’s accommodations to the Curse widen after Pentecost? The Kingdom begins to break in with Christ and breaks in further with the arrival of the Holy Spirit. Such a reading undoes the realities ushered in by the arrivals of the Son and the Spirit. We read God’s redemptive story forward, not backward. Heaven is better than Eden. Alcorn’s trump card is that eating meat would mean the suffering and death of animals, which is in conflict with the promise that there will be “no more death… or pain, for the old order of things has passed away.” Alcorn points out the text doesn’t say “human death or pain.” But again, this misunderstands the redemptive story. We as humans are God’s image bearers. No other animal holds that distinctive. We alone could reject God. We alone bore the curse of death because of that. The death of animals, then, is possible in a perfectly good world. In the meanwhile, grow in experiencing community as God intends – enjoying friendships, serving one another, and exhorting each other. This is our dress rehearsal. If you find yourself withdrawing because of past hurts or disappointments, don’t give up, knowing the ultimate good God has for you. If you find yourself not seeing many others you would like to have a deeper friendship with, grow in humility and curiosity. There is no human being who is not worth knowing, there is no person you can’t learn something from, you can’t connect with, and in whom you can’t benefit and enjoy the benefits they have for you. “How many angels can dance on the head of a pin?” This absurd question is attributed to William Chillingworth , who was mocking the penchant of some medieval theologians for expending their energy debating meaningless topics. Dreaming about heaven is no worthless theological debate over angels on the head of a pin! Our anticipation of heaven has the power to radically re-shape our lives to be more like Christ, looking toward the joy set before us. Dreaming about heaven bends our hearts toward God’s heart. The most significant positive impact dreaming and anticipating heaven has on us is shaping our hearts to value that which lasts. Our anticipation of heaven shapes our lives as we prepare for heaven. It’s a lot easier to make it through a tiresome day at work in the perspective of eternity, it’s a lot easier to do the hard work to pursue reconciliation in the midst of a broken relationship in light of the eternal and pure relationships we are called into, it’s a lot easier to deal with whiny and ungrateful children when you consider the eternal perspective of parenting. And beyond that! It’s not just easier to make it through, the reality of eternal life brings meaning to even tedious or tiresome tasks. That diaper you are changing? It is an act of love and service toward an eternal being, loved by God. Trying to steer lunchtime conversation away from gossip and to personal and spiritual matters? The eternal fate of souls lies in the balance. This book is a really fun read. Just know that Alcorn operates off of what he calls the "principle of continuity," meaning that the New Earth is going to be almost exactly like the Garden of Eden. I don't have a problem with that line of thinking, but I'm also not ready to say it's explicitly in the Bible, like Alcorn does - but it certainly seems to be implicitly there. There are a couple times where he states his own speculations as if they're fact. Like when he says at the bottom of p. 254 tha This book is a really fun read. Just know that Alcorn operates off of what he calls the "principle of continuity," meaning that the New Earth is going to be almost exactly like the Garden of Eden. I don't have a problem with that line of thinking, but I'm also not ready to say it's explicitly in the Bible, like Alcorn does - but it certainly seems to be implicitly there. There are a couple times where he states his own speculations as if they're fact. Like when he says at the bottom of p. 254 that "The morning star is a celestial object - the planet Venus." What?! No biblical warrant mentioned whatsoever for that one. I also disagree with his theology behind why infants who die go to heaven. I agree that they do all go to heaven, but not for the reasons Alcorn states. This is a book I often go back to. Because it is a book that changed a significant portion of my theological mindset. Before reading this book, I have to admit my view on what heaven will be like was deeply inaccurate. And I am happy to report that the reality of heaven is much more exciting! 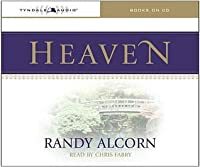 Randy Alcorn does an amazing job of using the text of The Bible to piece together a great picture of what heaven will be like, and it blows away most erroneous depictions of heaven thanks largely in part to This is a book I often go back to. Because it is a book that changed a significant portion of my theological mindset. Before reading this book, I have to admit my view on what heaven will be like was deeply inaccurate. And I am happy to report that the reality of heaven is much more exciting! Randy Alcorn does an amazing job of using the text of The Bible to piece together a great picture of what heaven will be like, and it blows away most erroneous depictions of heaven thanks largely in part to our media heavy culture as well as inaccurate translations or out of context verses. The heavy biblical support and a purposeful approach of not presenting speculation as fact, makes this book a great read that I can’t recommend enough. Randy is a great writer of both fiction and non-fiction. This book is the definitive book on Heaven. He also has the "Heaven for Kids," in paperback version, which I am currently reading to our family weekly, on our Sunday evening family time. What I like about Randy is that he makes Heaven real and a place you long to go, not the fictitious "eternal church service" that some people portray it as. He is also very clear when he is quoting directly from scripture or when he is speculating based upo Randy is a great writer of both fiction and non-fiction. This book is the definitive book on Heaven. He also has the "Heaven for Kids," in paperback version, which I am currently reading to our family weekly, on our Sunday evening family time. What I like about Randy is that he makes Heaven real and a place you long to go, not the fictitious "eternal church service" that some people portray it as. He is also very clear when he is quoting directly from scripture or when he is speculating based upon his understanding of the Bible. A great book to give people who have lost a loved one or are going through difficult illnesses. "My ministry focus is communicating the strategic importance of using our earthly tim Randy Alcorn is the founder of Eternal Perspective Ministries (EPM), a nonprofit organization dedicated to teaching biblical truth and drawing attention to the needy and how to help them. EPM exists to meet the needs of the unreached, unfed, unborn, uneducated, unreconciled and unsupported people around the world.